The Japanese game is listed on Nintendo's website as "Mario & Luigi RPG 2," although its title logo reads "Mario & Luigi RPG 2x2." Even though it was developed by Alphadream in Japan, MLPIT was released in the U.S. first, most likely to get it out on store shelves for Christmas shoppers. 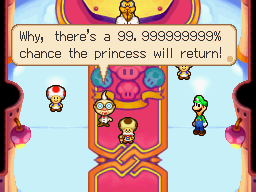 Early in the game, E. Gadd gives the probability of Peach returning in the time machine. Her chances improve in the U.S. version, where the number has three more decimal places. 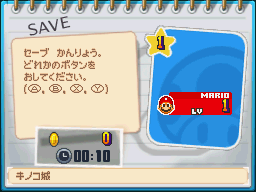 After saving your game, the Japanese version has commas between the circled button letters. 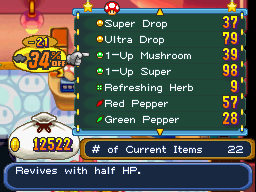 Both 1-Up 'shrooms cost 20 more Coins in the U.S. version. 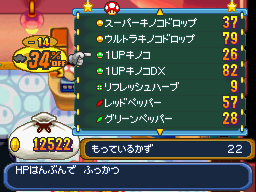 The price before Stache discount for the 1-Up Mushroom is 40 Coins in the Japanese version and 60 Coins in the U.S. version. 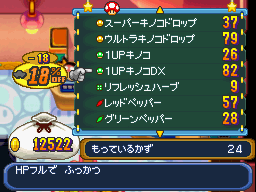 The 1-Up Super's price before Stache discount is 100 Coins in the Japanese version and 120 Coins in the U.S. version. For the Bros. 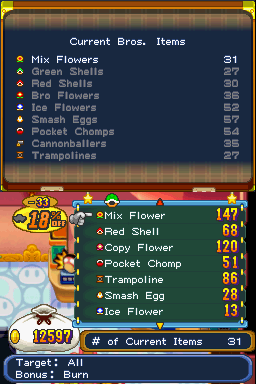 Item selection list on the bottom screen, the U.S. version puts the newest items at the top, whereas the Japanese version has them ordered by type. Notice that the "Current Bros. 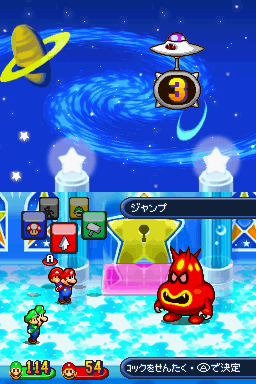 Items" order on the top screen matches the order on the bottom screen in the Japanese version, but it was not changed to match the new order in the U.S. version. This causes the highlighted line on the top screen to jump around wildly as you scroll through the items on the bottom screen. 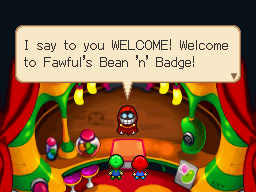 "Fawful's Bean 'n' Badge" is known as "Gerakowitz Salon" ("Fawful Salon") in the Japanese version. 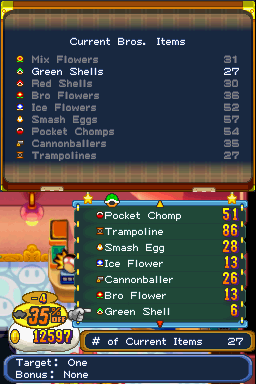 Translated by Tim O'Leary and rewritten by Nate Bihldorff, the original Japanese script received small changes throughout the game. For example, when the brothers revive Toadsworth, he shouts "Kinojii revival!" 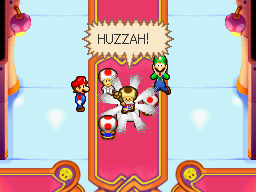 in the Japanese version, which was changed to "HUZZAH!" in the U.S. version. One not-so-subtle change is seen when meeting the Hammer Bros. in Vim Factory. To help show that they are not their normal selves, their Japanese text is entirely in katakana. 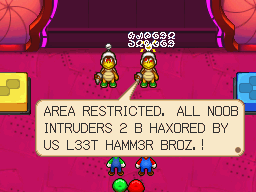 In the U.S. version, the Hammer Bros. talk in L33tspeak. 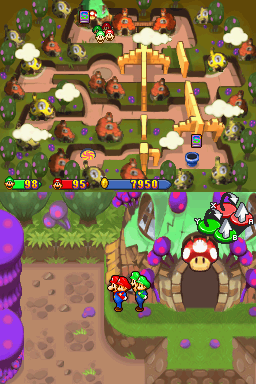 The second Yoshi that hatches from Sunnycide's eggs is yellow in the Japanese version and black in the U.S. version. 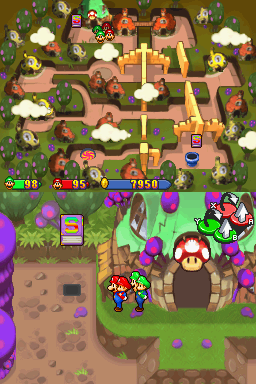 The Save Album in the north-western area of Toad Town is inside the item shop in the Japanese version, but outside it in the U.S. version. 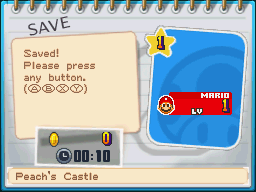 It looks a little better on the map screen with the Save Album icon moved off of the shop. 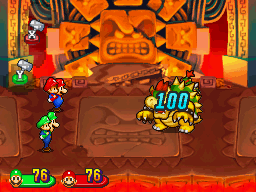 Bowser, Elder Shrooboid, and the elder Princess Shroob have "automatic attacks" in the Japanese version. When the player attacks the enemy, a "!" appears over the enemy's head, who will then attack back no matter whose turn it is. 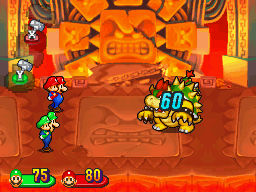 Bowser's automatic attack is his fire breath, Elder Shrooboid's is his rotating spiked ball, and Princess Shroob's attack is her body ram. 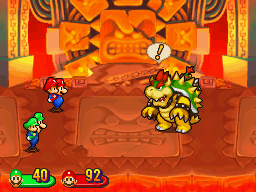 Baby Bowser will sometimes use mushrooms to heal himself or Bowser. In the Japanese version, they restore 60 HP. In the U.S. version, they restore 100 HP. In his second phase, Elder Shrooboid brings out a UFO that deals instant death when its countdown timer reaches zero. 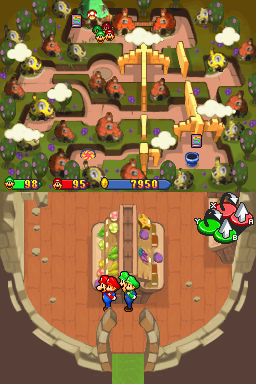 You may recall in the U.S. version that the UFO starts on the right side of the top screen and switches sides every turn. 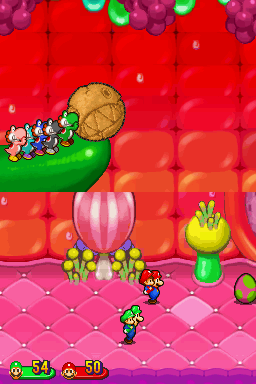 To reset the UFO's timer, the babies must hammer the spiked balls thrown by Elder Shrooboid into the UFO. 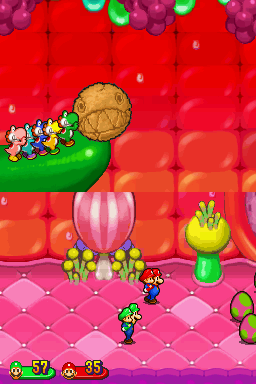 It's a little tricky, because Baby Mario hammers the ball up and to the right, whereas Baby Luigi sends it straight up. 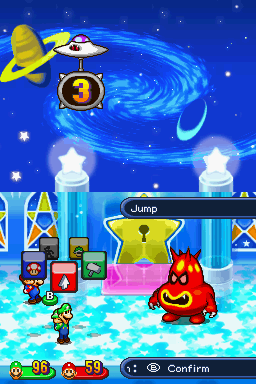 Hitting the UFO is a little easier in the Japanese version, where the UFO stays in the upper-right corner, and both babies hammer the spiked ball up and to the right. 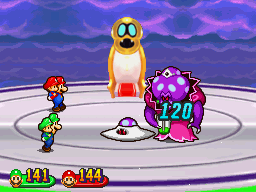 One of Shroobsworth's attacks consists of him and Intern Shroob throwing a purple meteor. The meteor flies through the air faster in the U.S. version. 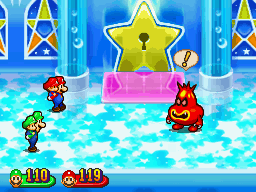 In the U.S. version, when the player defeats the first Princess Shroob, the victory screen appears showing that no experience points or Coins are awarded. 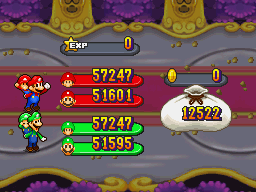 In the Japanese version, the battle screen immediately fades out to the field after the death animation. 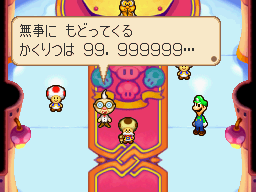 According to Toadsworth, "Shroob Castle" is what the Shroobs call Peach's Castle (Past). The name does not appear in Save Albums. 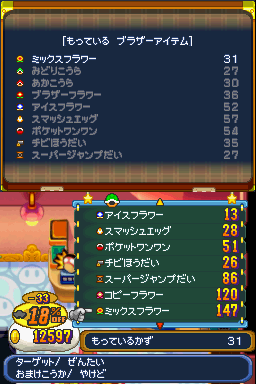 The following chart also lists enemy stat changes for heart points (HP), experience points (Exp), and Coins. 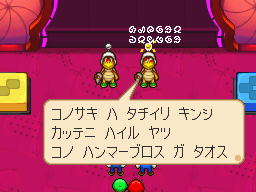 ハンマーブロス Hanmā Burosu Hammer Bros.
*Masutā means master (e.g. arts and science). 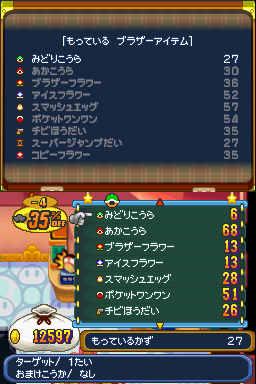 Usually, HP/Exp/Coin changes occurred along with changes to Power, Defense, or Speed. See our M&L:PIT guide for the complete stats list. "Yari Yasshi" (Coconutter) comes from two words: Yari, meaning "spear", and yashi, meaning "coconut tree". The name "Togerian" (Spiny Shroopa) comes from two words: Toge (spike) and eirian (alien). Gnarantula, the cloud-covered spider, has a design inspired by the Japanese word kumo, which means both "spider" and "cloud." Gnarantula's Japanese name: Kumonchura. 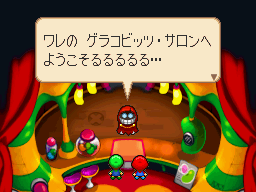 Boo Guy's Japanese name, Reiho, contains the word for ghost (rei). 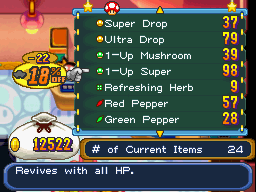 It also rhymes with Heiho, the Japanese name for Shy Guys. 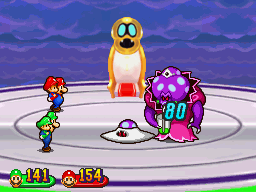 In the U.S. version, when the Shroob Missile impacts the Koopa Cruiser, the transmission screen on board shows Princess Shroob laughing before it goes to snow, but with no audible laughter. In the Japanese version, we hear her laughter. The Japanese game plays the "Piggyback" sound effect when the baby gets back on the adult after a successful piggyback jump attack in battle. 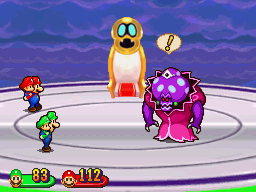 Ominous background music plays during the scene with elder Princess Shroob. 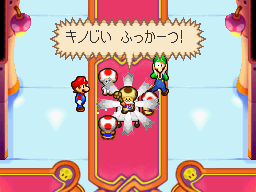 The Japanese game starts the music when the elder Princess Shroob appears, but in the U.S. version, the music starts right before the battle begins (after Stuffwell's lines). After the staff roll, the Japanese version plays a slow music box tune, but the U.S. version goes silent. The sound data for this music is not even present in the U.S. ROM, so it was probably added in the time between the U.S. release and Japanese release. The "Got Key Item" theme plays when Baby Luigi picks up the Princess Shroob mushroom in the Japanese version, and after the Babies retrieve Baby Princess Peach. Special thanks to NintendoExpert89 for contributing sound clips and most of the information.